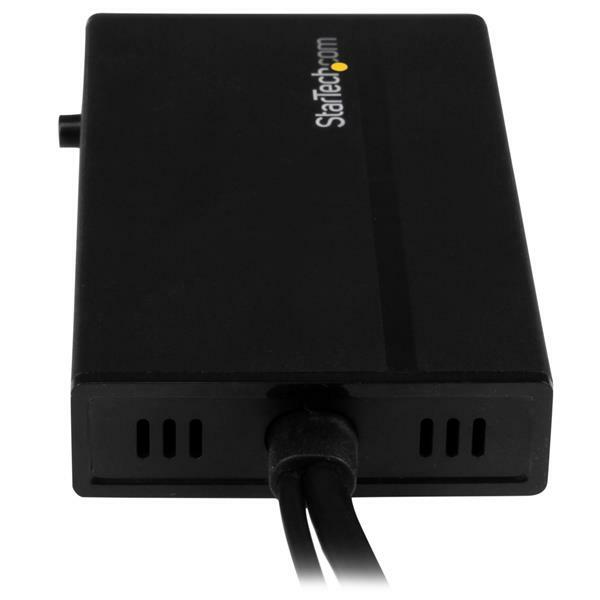 This travel adapter lets you connect your HDMI enabled Ultrabook™ or laptop computer to any DisplayPort, VGA or DVI display. 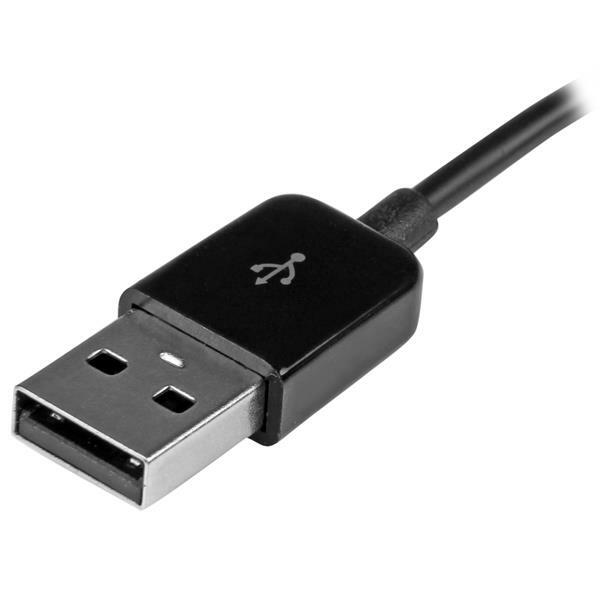 To ensure compatibility with your computer, the adapter has been engineered to support both Windows® and Mac computers. This 3-in-1 adapter gives you all the video outputs you need to connect to any projector or display. 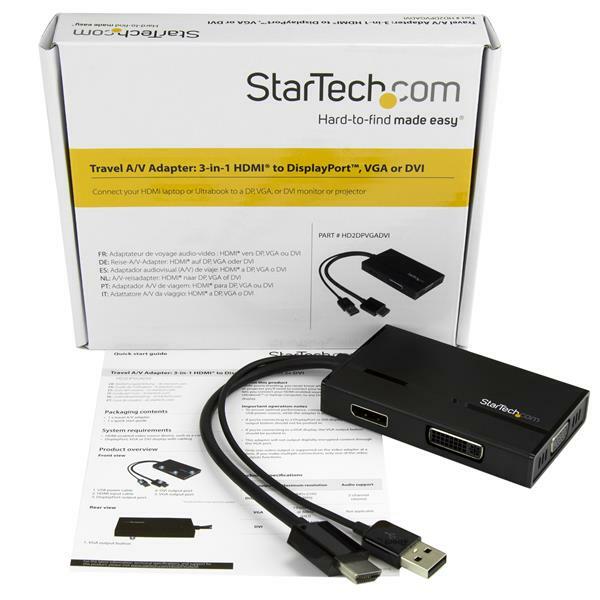 With DisplayPort, VGA and DVI outputs, this adapter lets you connect from your laptop's HDMI port to any boardroom or classroom display, without the inconvenience of carrying a separate adapter for each display type. With support for multiple video outputs and a lightweight, small-footprint design, this adapter is the perfect solution for traveling professionals, such as sales representatives or instructors. 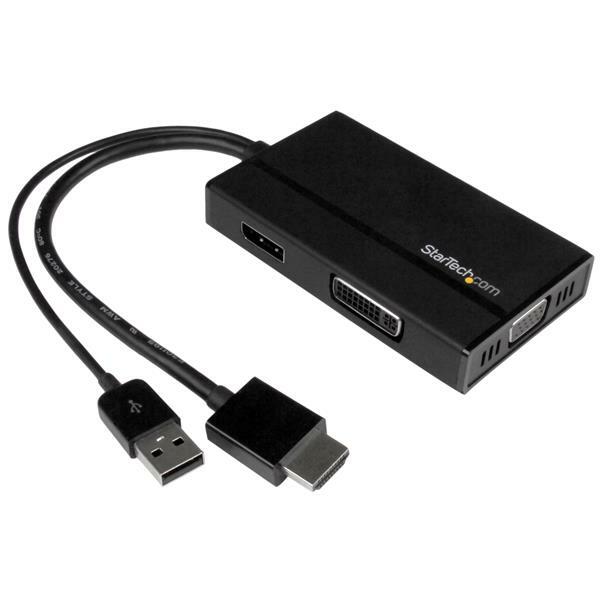 The 3-in-1 A/V adapter is also great for BYOD (Bring Your Own Device) applications around the office. The adapter features plug-and-play installation, enabling you to quickly and easily connect to almost any display you come across, so you can focus on the finer details of your presentation and not the technical details of a boardroom's A/V setup. It’s USB powered, which means a power adapter is not required, making the adapter easier to carry. Plus, you can just plug the adapter into your computer, instead of having to find an additional power source. 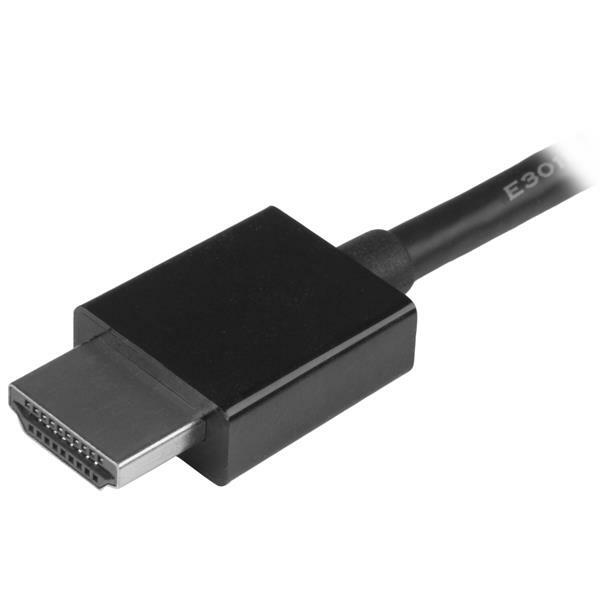 The DisplayPort output on this adapter supports Ultra HD 4K resolutions, providing four times the picture quality of high-definition 1080p. 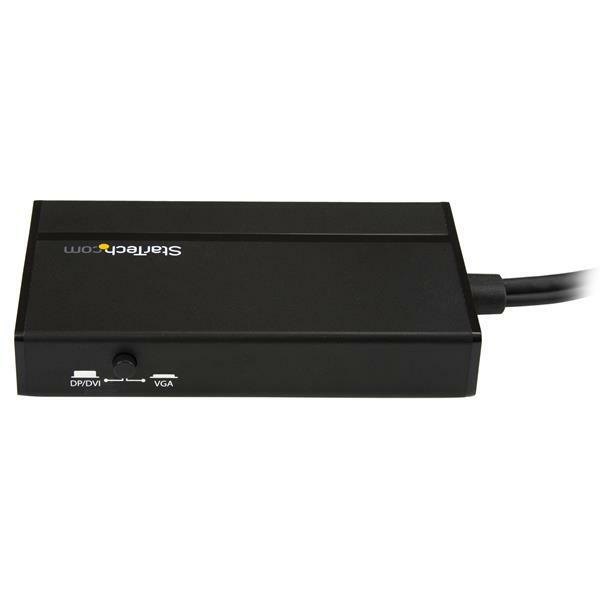 The DP output is also backward compatible with lower resolutions, such as 1080p and 720p, so the adapter is also perfect for your legacy video equipment. The VGA and DVI outputs also support a high-definition maximum resolution up to 1920 x 1200, so you can still enjoy excellent video quality. Note: This adapter will not output digitally encrypted content through the VGA port. 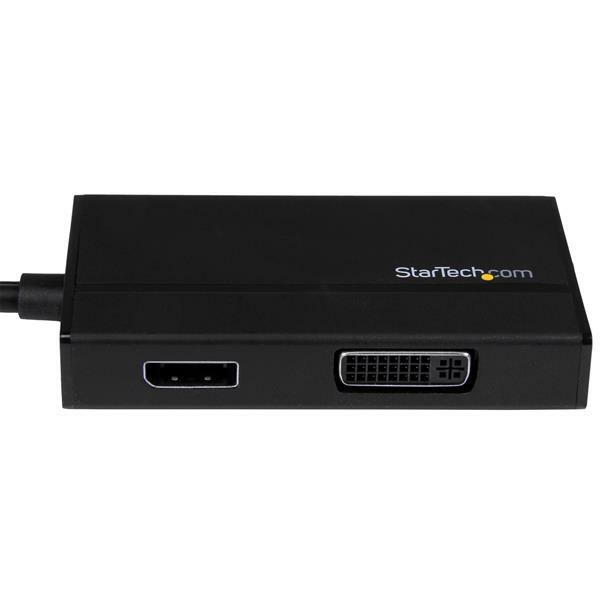 The HD2DPVGADVI is backed by a 2-year StarTech.com warranty and free lifetime technical support. Note The DisplayPort output is an active port. The VGA output is an active port. The DVI-D output is a passive port. In my computer's display settings, the display connected through my HD2DPVGADVI is categorized as a generic display. How do I fix this? Sometimes the Extended Display Identification Data (EDID) is not captured when your display is initially connected to the HD2DPVGADVI. 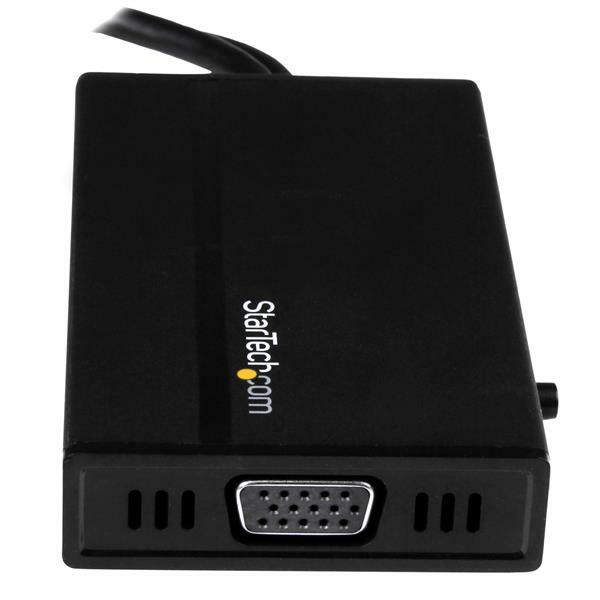 Unplug the USB cable on the HD2DPVGADVI. Plug the USB cable into the HD2DPVGADVI.